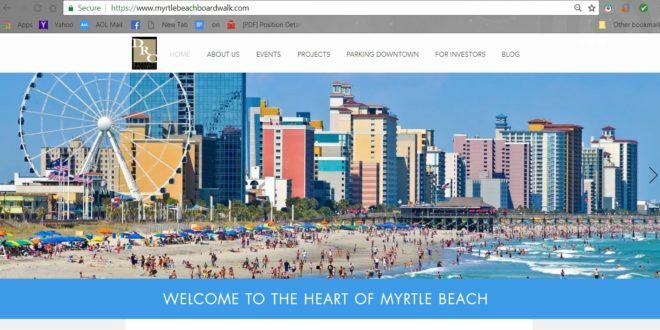 Main web page of the Downtown Redevelopment Corporation is www.myrtlebeachboardwalk.com ? ABOUT US: “The Myrtle Beach Downtown Redevelopment Corporation’s (DRC) mission is to initiate and facilitate the revitalization of downtown Myrtle Beach. This will be accomplished through the establishment of strategic aesthetic, functional, and business development goals; the addition and enhancement of public infrastructure; the creation of economic and other incentive programs; and through partnerships with the private investment and development sectors. Why the DRC does not have a stand alone page but instead chooses to affiliate with the Myrtle Beach Boardwalk, is interesting as it takes a few moments to actually even find their site. And why the Boardwalk? Do they not represent ALL of the Downtown area? Another question is why is this a “corporation” and not part of the actual City government yet still under the City? They accept and use tax monies from the public. See, it’s the little things that keep Citizens wondering if the DRC is in fact part of a “shadow government” and able to do things under the flag of government that government can not do itself, such as buying and selling land or picking certain areas they deem more important for development because they are a “corporation”. It’s much like the Myrtle Beach Regional Development Corporation is indeed a corporation but works under the flag of Horry County government yet also receives tax payer funding. One issue and the most surprising to those who do not know the breakdown of the City of Myrtle Beach and The Downtown Redevelopment Corporation, is that John Pedersen, who is in command as the City Administrator of Myrtle Beach is ALSO the Treasurer for the DRC. That’s a very interesting relationship in and of itself. The biggest question most Citizens ask is “why”? As of yet we’ve yet to receive any valid reasoning. At the core of the issue when the DRC was first initiated, the downtown area of Myrtle was booming but it was also becoming a weary area with neglected infrastructure issues, parking issues, and crime issues which were becoming more and more apparent to the common resident as well as the seasonal tourist. As well reports state the pavillion was losing money in keeping the amusement area alive. Apparently at the time the City believed that instead of the City taking it upon themselves and pushing their departments to come up with a way to address the issues, they decided to create another department, one which would only heed to the City, and one which would eventually cost hundreds of thousands of dollars a year to maintain. Even though there are quite the list of competent employees on the DRC, they still have in the past and currently feel a great need to hire their work out to other people, to the tune of more hundreds of thousands of dollars in consulting fees and special “projects”. Both the City and the DRC enjoy special allotment of Federal and State grants and all the while the Citizen asks where their City tax money is flowing. Four years later by 2004 the DRC had initiated revamping the downtown area including the still active Pavilion site, hiring Barry Landreth of Webster Realty Investments who turned out being a fraud and cost the city not only wasted time and fees but huge embarrassment. Evidently the City failed to properly vet Landreth and by the time they asked for validation Landreth had already aided the City in several news conferences and news releases about the new “vision” for Myrtle Beach which included perhaps removing the Pavillion area and replacing it with upscale entertainment and hotel/condos, shops and restaurants. Afterward Landreth withdrew from the City agreement and he was prosecuted for fraud in Orange County, CA. It’s unclear how much the DRC or the City had paid to Landreth during that period or if they even sought prosecution. By 2010 the hopes and dreams of Myrtle underwent a turn as it became caught up in the market crash. Imagine how far along Myrtle would have been by 2010 if only the City had done their job and vetted a fraudster at the get-go. As well, it begs the question as to how many other fraudsters the city has entertained without public knowledge. A full ten years later in 2014, the DRC hosted another in depth report fortunately from a very reliable source, the TAP Technical Assistance Panel from the SC Urban Land Institute. Within the report the TAP recognized and presented remedies on a plethora of issues. The report made lists of several City issues such as homelessness, downtown blight, building issues, crime, poor beach issues, and tourism, etc. This cost approx $15,000 for a three day visit and a 45 page report issued in December of 2014. Of the entire study the City appears to have taken little incentive for correcting the main issues, while being in haste to take the TAP suggestion of gateway appearances with road alignments. The DRC also apparently took from the list their idea of taking over the parking issues in the City, which brings in a large percent of their operating expenses as well. The City appears to have especially focused on eminent domain of private property and using it as a catalyst for moving the Children’s Museum. Otherwise baby steps appear to be in the works, especially as public demand increases each day over the past few years. Myrtle Beach Citizens still have received no clear idea if the City plans on installing the Museum or the Library and must unfortunately rely on bits and pieces found in gossip or seen in speck plans or on City or County tax or planning sites, again bringing into suspect the DRC being perhaps a shadow government for the City. This past week, the DRC has again hired two more consultants at the price of $90,000 for yet ANOTHER in depth study. The two consultants hail from Bench Mark Planning and are being paid for a 120 day study of the Downtown Myrtle Beach area. “How many studies do you need to tell you something is broke and it needs to be fixed?”…..
“When and how are you planning to actually fix these issues without justifying taxing the people even more or undermining their current quality of life?” …. Paying people to continually rewrite the “to do” list until your agenda is eventually on the list, or picking and choosing what you decide is best on the list, is costing the taxpayers more the longer you flounder around looking for solutions you already have the answers to. Even grants and financial aid found through Federal and State sites, costs the taxpayers. Let’s stop playing politics and start taking action. We do not need more commissions, studies and vague associations. If you can’t lead, step down, step aside and let those who know how to direct and lead the people take your place. WILL MYRTLE BEACH RESIDENTS BE ALLOWED TO VOTE?